Growing up in Lynden, I kind of hated the Pioneer Museum. Yes, Phoebe Judson is a saint, she named Lynden with a ‘y’ instead of Linden because it was prettier….blah. I realized that there were a lot of places around Daegu that I didn’t know, and started my vacation last week with a $5 tour around Daegu. An entire tour bus, a non-English speaking guide, a driver and…just me. Do you see where this party train is going? We began by checking out the Bullo-dong Tombs in eastern Daegu (Dongdaegu), which are huge mounds of dirt where it is thought the rulers of the area in the 5th and 6th century AD were buried. My guide was (is?) a professor at Yeungjin College, my employer, and had a laugh or two with me in the sunshine as we walked along a bunch of graves. His daughter is a pharmacist (or going to pharmacy school?) in LA, and he told me how he misses her. Next we visited a brass museum, which was a little forgettable since pouring molten hot metal and beating it with sticks *sounds* like my jam, but really isn’t. Well, maybe *actually* doing it would be, but watching videos of it just isn’t. Then we drove to Mt. Palgongsan and Donghwasa Temple, where I fell truly, madly, deeply in love with some lanterns. This is when my Korean and Chinese speaking guide began to warm up to me as she watched me chase grains of rice around a bowl with chopsticks in vain. She has a 4-year old daughter and is expecting her next one, a boy! in just 4 months. Sidebar: I have got to stop hanging out with so many gorgeous pregnant women because I am not carrying another life and I haven’t figured out how to dress as classy. So then I got on a bus to Mokpo, 4 hours away, and discovered that I had told my host the wrong week that I was coming. This prompted a flurry of filling out my CouchSurfing profile, AirBNB, Facebook, and attempting various smoke signals to try and find somewhere to stay that night. I was kind of nervous excited (read: terrified) about maybe sleeping in a jjimjilbang and kept repeating that Helen Keller quote: “Life is either a daring adventure or nothing at all.” I arrived in Mokpo to see Jenna, a high school friend, arrive with blankets and a place for me to stay with friends of hers that night. RISE AND SHINE, YO, YOU GOT A TOUR IN THE POURING RAIN TO DO! 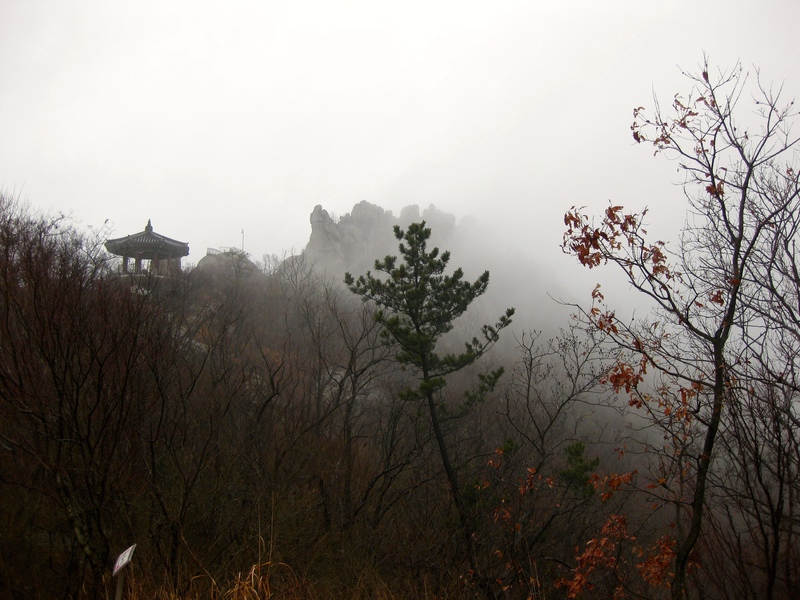 Another day, another guide with almost no English at all, 4 museums, a lunch where I put a whole clam in my mouth and raw oysters too, 5 Koreans over the age of 50 and then…then…I climbed a mountain. On our Mokpo tour there was a couple in their 50s with maybe 1% English to my 2% Korean. So we had pretty much just done a lot of smiling at each other for about 4 hours. The tour ended and the guide asked me, “you want to climb Yudalsan?” Thinking it was all part of the tour still, I said “YES!” only for him to jump in his car and leave me looking at the two of them as they gestured to get in their (very nice) car. Now…Single White Foreign Female 101, Chapter 2: “Liam Neeson Will Not Always Be There” ($39.95 on Amazon) dictates that getting in the car of a nice looking couple with which you cannot communicate is not really the *best* idea. But in the spirit of Ms. Keller and saying “yes” to unknowns (Improv Comedy 201)…I got in. We drove about 5 minutes to the base of the mountain (please, nobody google how tall this mountain is, I know I was no Bear Grylls here but I’m proud of my tiny accomplishment) and the rain is starting to just dump out. I’m in dark jeans, wool socks, Nike Frees, a deep green hoodie and my 8-year old black North Face fleece and my hosts are in full-on Korean hiking gear. If I looked like a natural-colored wayguk bear waddling around, they looked like a flower garden full of the happiest, brightest poppies you’ve ever seen. So we started climbing. The rain got worse. Station 1. I feel good. Station 2, it’s getting slick. Station 3, fog. Summit. A glorious, rainy, happy heart. I wonder how I ever work indoors. I grew up in the Pacific Northwest. I belong here on top of mountains. It’s in my hair, my eyes, my joy. Rainy, cold, wet, and the Koreans are laughing at how happy I am. I’m thinking of Marty and Mr. Kredit and home and here and wishing I had someone to share it with. But you can’t wait for someone else to live your life, right? At least, that’s what I keep telling myself. Going back down was treacherous but we found a surprise temple as we came back–hello, Indiana Jones, where are you? My hosts asked “jowa Soju?” which means “do you like Soju?” and I answered back with a slang phrase taught to me by Freddy Richmond, the cool, smoking older brother I miss dearly: “hanjan harkayo (lets have a glass).” Which I meant as a joke…and then we started driving around a shipyard and I was quite convinced that I was about to be cut up for parts. They’d tested me out and found I was halfway competent at climbing things (aka lots of stairs) and were going to sell my organs to the shipmongers. Which was fortunately not true as they then took me to a restaurant where we ate live octopus (낙지) and Soju! I only wish I’d taken a photo…but then you wouldn’t have seen all the tentacles squirming, which was kind of the coolest thing ever. I know that kind of luxury isn’t cheap and they wouldn’t let me pay for it either. NakJin and JeongSun: Thank you for teaching me about friendship without words; it’s not something I’ll easily forget. And then…Seoul. I took the KTX going aaaannyywhere…to Yongsan Station. I putzed around eating kimbap outside a palace and walked around Bukchon and another palace before my 2o’clock tour of the Bukchon Hanok village. The village is full of hanoks, a style of wooden houses that grew in popularity in the 1920s and 30s as Seoul expanded. The area is carefully preserved and yet very modern. For my Arkansas friends, think Hillcrest. Tulsa friends, think Blue Dome district. Old, historic, and full of too many hipster artists to count on both mustaches. I then went down to Itaewon, the foreigner district, for an hour to hunt down a few cans of Diet Coke and a new shirt or two before attempting to rendezvous with my host for the night. 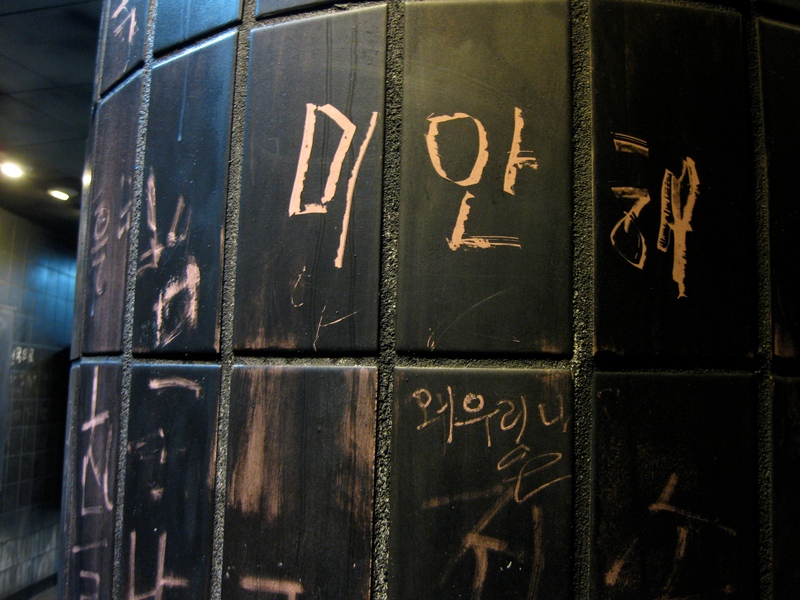 As I sat on the floor of Nowon Subway Station…I started to feel…off. I secured secondary housing (the second time this week, if you remember), as my host thought I was again coming a different day (do I need to set my clock differently or something?). And as I walked into her place, I pretty much became *that* scene in Bridesmaids. If you know, you know. I was every character in every place in her tiny bathroom. I nominate me for worst houseguest of the ever. After surviving the night, I pretty much crawled home to Daegu and the safety of my bed. Which only took about 9 hours to do, but still. MADE IT. I had a difficult time with this vacation. I requested it over 6 months ago to go to Hong Kong with college friends, but plans fell through in January. I only get 2 true vacation weeks of my own (we have to take 2 at Christmas) per year, and here I was, *wasting* it (or so I thought) as I bounced through Korea, a county I already lived in. Work was very slow this week, with people having mornings or whole afternoons off and I was angry that I was gone on an easy week. Angry I had to use this time and felt like it was wasted. Friends were in Thailand or Bali or the Philippines and I didn’t even leave the peninsula. And then I got sick and had to come home from Seoul on Friday rather than Sunday. 1. I didn’t have to teach at all this week. 2. I climbed a mountain. 3. I ate live octopus and soju with absolute strangers. 4. I saved some money! I think! 5. I saw some really old, unique places in this world that I may never have seen otherwise. I leaped. A little leap, but it felt kind of good. Next time: bigger leap. This entry was posted in Uncategorized and tagged baileysaywhat, daegu, DGEV, efl, esl, Itaewon, korea, mokpo, nowon, Seoul, South Korea, teaching, tefl, tesl, yudalsan. Bookmark the permalink. I’m proud of your leaps!